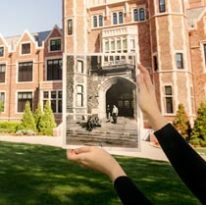 “The gymnasium was located in the Ad Building (today’s Main Hall) and was the scene of many events, not just sports. It had a stage, which was used for plays and speeches, and it was a good place to keep out of the way of what was happening on the floor of the gym.” Photo from the Hal Carstens ’50 collection (1946–48). 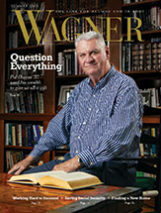 Berna Glover Eich ’69 passed along to me the winter 2015–16 issue of Wagner Magazine because she knew I grew up on the Ward estate in the 1930s and 40s. [The Ward estate, acquired by the College in 1949, was located on today’s stadium area. 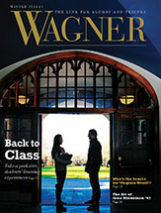 Read more about it in the feature story about the Wagner College Choir, “We Found Our Voice.” — The Ed.] 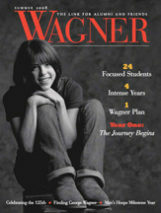 She thought I’d be interested in the article about the early days of the college (“Wagner College History Tour”). Back in the old days, the 1940s, my family lived on the Ward estate. The college was across Howard Avenue (then Serpentine Road), and activities going on there served as a magnet for us. The gymnasium was located in the Ad Building (today’s Main Hall) and was the scene of many events, not just sports. It had a stage, which was used for plays and speeches, and it was a good place to keep out of the way of what was happening on the floor of the gym. My brother and cousin would stand on the stage to post the scores at basketball games. The spectators were not so lucky; they were on either side of the action, and players could and would bump into them. When my parents went to see a game, there was the danger of play being interrupted by our black cocker spaniel, Wimpy, who would come looking for them, sneak through an open door, and walk jauntily right across the floor. Men’s basketball in the 1940s, in the Administration Building’s gym — today’s Main Hall Theater. “The spectators were … on either side of the action, and players could and would bump into them.” Photo from the Hal Carstens ’50 collection (1946–48). We were also loyal supporters of the football team. We cheered the water boy as well as the team under Jim Lee Howell’s direction. We applauded coach Herb Sutter’s efforts in the gym and on the baseball field. We attended graduation ceremonies and sang the new alma mater, “Beautiful upon the Hill” [adopted in 1947]. Everyone loved it. We became friends with faculty and their families. Professor Bacher, his wife, and son Pierre were refugees from France. Milton Kleintop, another professor, took a leave of absence during World War II to work in the employment office of the atomic plants located in Oak Ridge, Tennessee. When I went away to college, an ex-GI attending Wagner used my bedroom, since there was no room for him in Wagner’s dormitory for men. 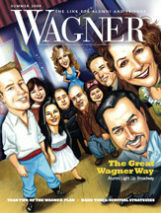 Wagner inspired loyalty and camaraderie. When I have met Wagnerians in later life, we know right away we have a common bond, and we tend to keep in touch with each other. Bravo, Wagner!